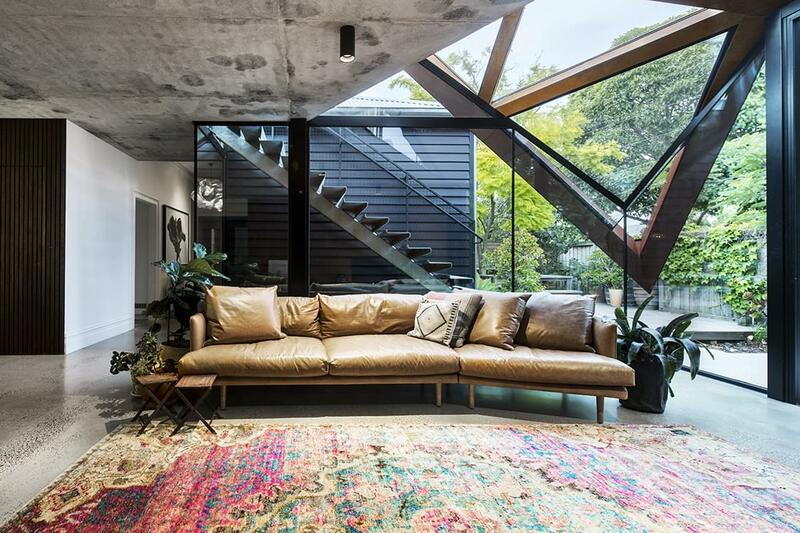 In this residential reconfiguration project in Melbourne, many restricting factors could have discouraged the home owner and the architect. 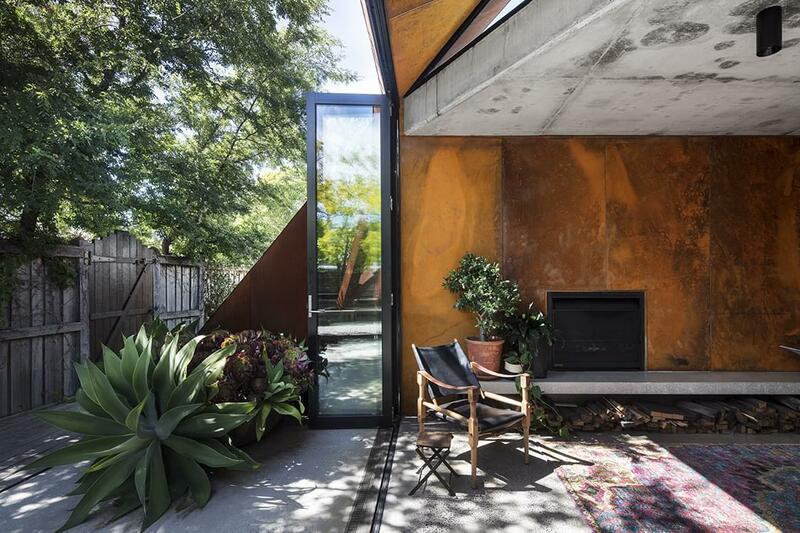 The site was already very tight with the existing 90-year-old house, a separate studio and a tiny back yard. The suburb is well-established and the neighbouring sites are just as tight with the houses very close to property lines. 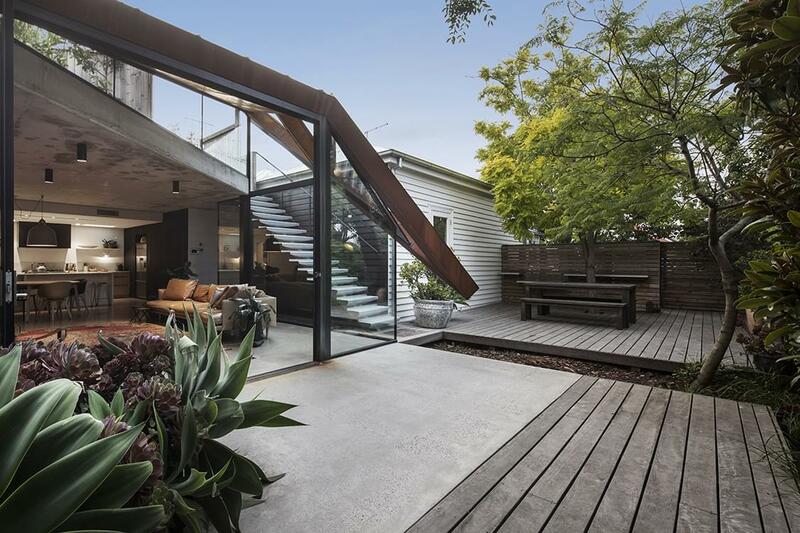 In addition, the existing house and streetscape have tight heritage controls. But the family of four was very clear in the brief: They wanted a new dining and kitchen space that would link the house and studio. They wanted both of the existing buildings fully renovated and they wanted a vegetable garden. And they want their home and lifestyle to become even more sustainable and self-sufficient. 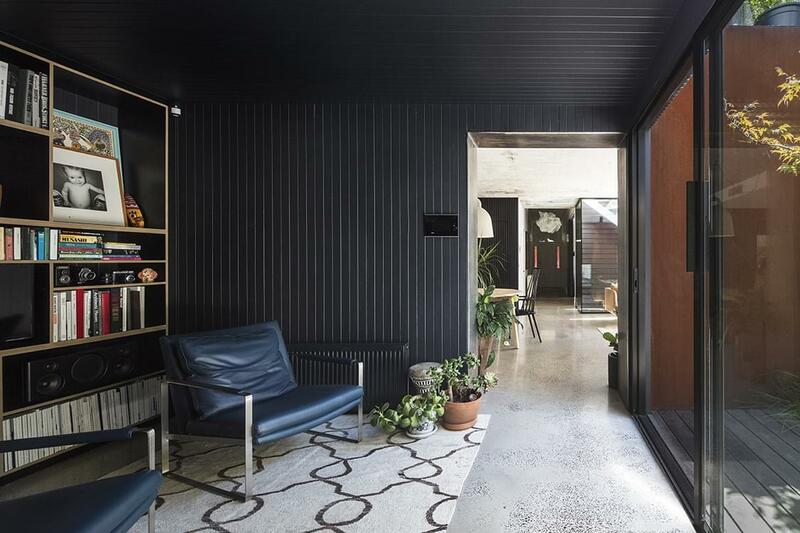 The obvious and more inconspicuous solution would have been to stay within the heritage style and material palette of the existing house, but the parties involved were not looking to be timid. 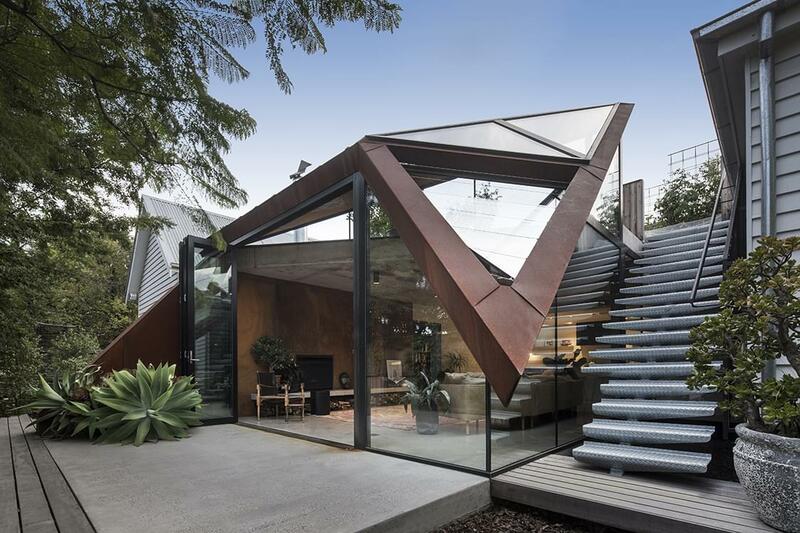 Melbourne architect Damian Rogers echoed the triangular roof forms and created an angular structure frame of weathering steel. It leans toward the existing house appearing to act as the protector of the house. 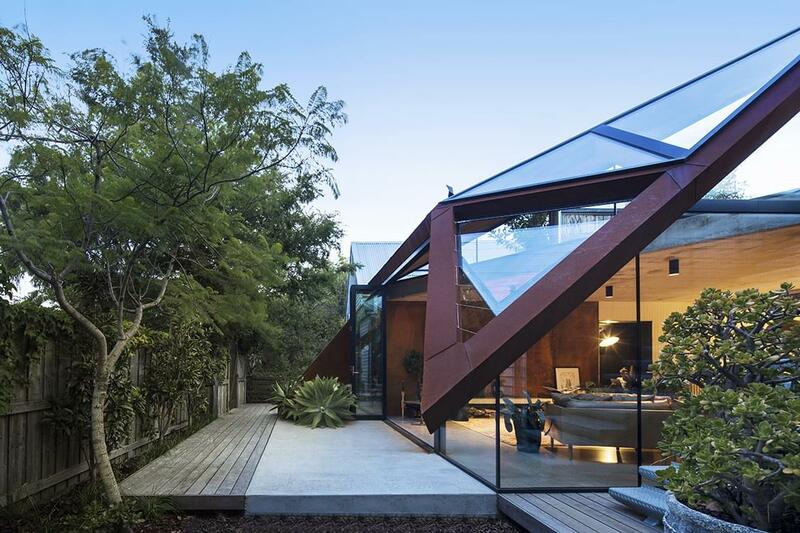 Angled glass roofs allow light in, and with the trees leaning in, the glass blurs the line between outside and inside. 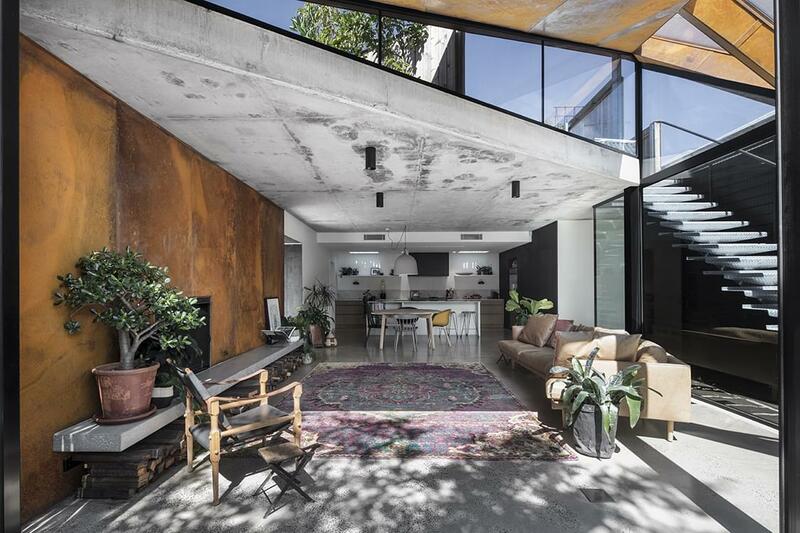 The entire residence, including the existing dwelling, studio and the new extension is now 250 square metres (approx. 2,700 sq.ft). The ground floor has three bedrooms, a lounge, a sitting room, a dining room, and a reading room, plus bathrooms, kitchen, pantry and laundry. 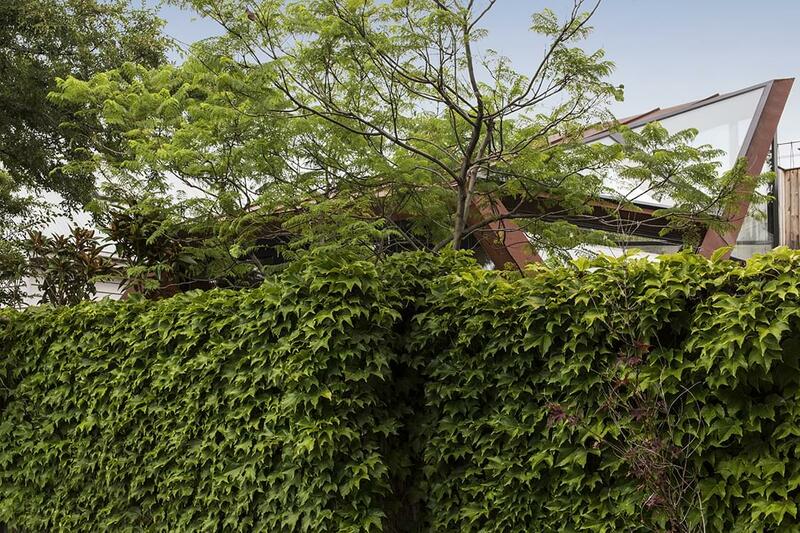 The upper level includes a retreat area and a rooftop garden, Rogers’ solution to the lack of gardening space that was underscored by the increased dwelling space. The much-desired vegetable garden is now, a year and a bit after completion, a vibrant garden where the family grows tomatoes, chillies, cucumbers and many more vegetables. “They say they rarely buy vegetables these days and it has become quite a passionate interest,” Rogers reports.